Presents a system of multivariate analysis techniques in cases where statistical data may be of different measurement levels such as nominal, ordinal or interval. It covers methods of studying the stability of these techniques, including resampling by the bootstrap and jackknife and discusses sensitivity analysis through first-order approximations. The alternating least squares algorithm is used as a general model and treated in detail for the most important special cases. Among techniques covered are correspondence analysis, principal components analysis, canonical correlation analysis and various ordination techniques. The exposition also includes historical overviews, basic theoretical results, algorithmic efficiency and applications. Emphasis is placed on graphical display and nonlinear transformation of variables is used to obtain simple displays. 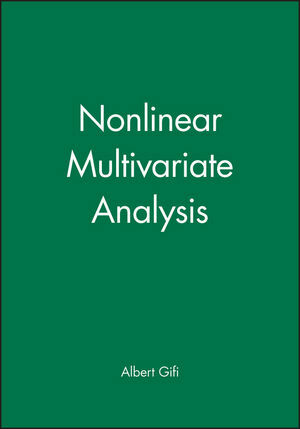 Albert Gifi is the author of Nonlinear Multivariate Analysis, published by Wiley. Conventions and Controversies in Multivariate Analysis. Asymmetric Treatment of Sets: Some Special Cases, Some FuturePrograms. Multidimensional Scaling and Correspondence Analysis. Models as Gauges for the Analysis of Binary Data. Nonlinear Multivariate Analysis: Principles andPossibilities.